This just in from my old Oxford college. The Times They Are A’ Changin’ . . .
It’s a clever debating tactic to try to turn your position’s weakest point into a strength. Critics of the Rhodes Must Fall movement have bravely claimed that theirs is the side of historical truth while their opponent’s position resembles those totalitarian regimes that write histories to suit their undemocratic purposes. But of course British history as it is taught in our schools, sold on our bookshops’ shelves and depicted on our screens is still dominated by an incurious Whiggism that almost entirely fails to address colonialism and racism. Not only are the Magna Carta-based arguments for the expansion of African enslavement brushed out of the 17th century story of the ‘glorious revolution’, but Britain’s prominent role in expanding the slave trade and the continued legality of colour-based racism until the 1960s are carefully obscured by a focus instead on the antebellum American South and the 1960s US Civil Rights movement. There is no room here either for the question of who moved enslaved Africans to and governed over North America in the first place, or why Enoch Powell was joined by the majority of his party (and some Labour MPs) in affirming that ancient English liberties required white people to have the freedom to deny people a job because of the colour of their skin, an affirmation that was probably legally accurate until the 1968 Race Relations Act. A key aim of the Rhodes Must Fall movement is to tell our history more openly and honestly. Counterarguments for keeping statues of racist colonisers to recognise explicitly the bad acts of the past elide a key point about our dominant national story. In Britain we don’t currently teach the history of enslavement or colonialism well (if at all) – as David Olusoga has asked, can anyone name a single British slave ship or slave-owner? Instead, the Department of Education has recently proposed adding Clive of India, a man Simon Schama describes as a ‘sociopathic corrupt thug’ to the national curriculum, and presents a shoddy one-sided account of William Wilberforce and his unique contribution to the abolition of slavery. The Rhodes Must Fall movement is not only or mainly concerned with statues, and is rather making a wider point: that racism and colonialism are deeply embedded in Britain’s history, and not just in terms of African enslavement or Enoch Powell’s ‘rivers of blood’ speech. Our economic development as a global mercantile power and the manpower that fuelled the industrial revolution were built on the enslavement of Africans, working in Jamaica’s sugar plantations, Virginia’s tobacco fields (a crown colony from 1624, and where there were 300,000 slaves by the 1750s), and the cotton plantations of the Deep South whose raw materials helped make Lancashire wealthy. The neglected reality of racial inequality at the centre of British history reveals four fallacies or errors among Rhodes Must Fall critics. First, they fail to see Cecil Rhodes as the crown prince of a central theme of British and indeed European history, reflecting not just Rhodes’ personal and depraved racism, but its implication in our wider economic, social and cultural history. In calling to remove statues of Rhodes, the Rhodes Must Fall movement explicitly argues their target isn’t just about Cecil Rhodes as an appalling individual racist, but what statues erected to honour him say about us as a society. The second error critics make is that the Rhodes Must Fall movement is somehow opposed to free speech or wants to silence discussion about Cecil Rhodes. One difficulty for the Rhodes-statues-must-stand position is that that most such statues are currently unopposed by any counterbalanced (i.e. historically accurate) statues, installations or appropriate explanation, whether in our curriculum, wider national story or in situ. Viewers of a statue assume the person so represented must have done something worthy, something that distils for posterity values that can stand the test of time. (And of course they would be right in terms of why the statue was initially erected.) 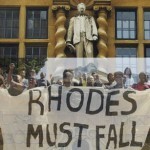 In response, the Rhodes Must Fall movement is insisting both that racial inequality has deeper historical or structural roots in Britain and that Cecil Rhodes is reasonably viewed (even by defenders of his continued representation in British statuary) as a totemic symbol and apex – or, rather, nadir – of the moral and economic superiority that justified those inequalities. When such a statue is erected at an ancient Oxford college, it only adds to the sense that we are reflecting on the form of an important national hero. There is something particularly potent about Cecil Rhodes’s position in front of an Oxford college, so even it’s true that we can’t tear down all of his statues (or that of all of Britain’s past racists), it’s doesn’t follow that we shouldn’t remove any of them. It certainly doesn’t help the critics’ case when they fail to suggest what additionally we could or should add to the statue or to our wider discussion of enslavement or colonialism, and instead brush over these points as attempts to rewrite history or political correctness. If such concessions were considered, the continued placement of (some) colonial-era British heroes around the country would attract far less criticism. As important as correcting historical inaccuracy is understanding its on-going effects on Black and minority ethnic people living in Britain today. Rhodes Must Fall critics’ third error is misunderstanding or misidentifying the real harm these statues perpetrate on BME people. Why did people cheer so strongly or agree so widely that statues of Saddam Hussein in Iraq or Joseph Stalin across Eastern Europe should fall? Not just because they rejected their politics, but also because those statues were a reminder of the personal experience of injustice and the denial of human rights perpetrated by those rulers. Similarly, it is one thing for a white British person to look on a statue of Cecil Rhodes and see moral error in someone who might look like an ancestor. White people may visit the British Museum and feel greater personal connection to the large well-framed photos of a great archaeologist, but many others instead see the smaller more numerous unidentified bodies in the background excavating sites in Egypt or India as their more plausible ancestor. It therefore suggests a lack of reflection or perhaps empathy to argue that black people looking on a statue of a racist coloniser today are expressing merely ‘hurt feelings’ or ‘political correctness’. In reality, when a black person looks on Cecil Rhodes’s statue, she sees a person who denied her basic moral worth, and would have justified enslavement, ruthless autocratic rule, and the sadistic treatment of her and her ancestors. Too many critics of the Rhodes Must Fall movement don’t understand the moral badness of racism: specifically its denial of equal moral worth, or humanity, to all non-white people, and the consequent group-based nature of the harm. Whatever sense of self-worth, talent or success a non-white person achieves as an individual is irrelevant to the colonial-era and modern-day racist, and seeing Rhodes so recognised is a deep wound that isn’t merely in people’s heads nor in any way irrational. The anxiety of living in a racist society is thinking that at any moment you might be shoved off a train by a fellow citizen, be denied a job, abused by a co-worker or detained by criminal justice institutions that are supposed to protect you, all merely because of the colour of your skin. As a corollary to the misunderstanding of the harm of racism, critics of Rhodes Must Fall seem unaware of continued racial inequalities in British society, given their focus on mere feelings and ascribing totalitarian political correctness to those in favour of removing the statues. The fourth and final error of critics of the Rhodes Must Fall movement is in fact an over-emphasis on the past, or on how and whether the ancientness of a practice insulates it against contemporary moral judgments. There may be cases where a tradition’s centrality in a nation’s sense of self is so important that it cannot easily be jettisoned even if it harms some current citizens. In practice it’s hard to imagine such examples, though it appears this is indeed the position of Dutch defenders of Zwarte Piet. This comparison will undoubtedly bring howls of protests from those who say they aren’t defending Cecil Rhodes, but instead the freedom of Oriel College to continue to stand him up prominently in Oxford. Yes, of course, Oriel College, Oxford and others are free to continue to portray Cecil Rhodes however it wants, and also free to say he represents something important about today’s Britain and our values. But the question for us in the present is not only how should we understand our history, but how that history speaks to us for the kind of society and values we seek to affirm today and in the future. With Oxford colleges (and indeed all of Britain’s – and South Africa’s – major institutions) still having so few black representatives, it’s curious that those well placed in those institutions should object to measures that might not only more accurately represent history, but also seek to make those places less filled with the cultural detritus of empire and so less stifling for non-white students, employees or customers. Note that this isn’t just or only an issue for ethnic minority Britons, but for white Britons too, who need far better understanding of the diversity of their own country, and also greater ability to navigate a more interconnected world where India and China tell decidedly different stories about Britain’s role over the past three centuries. In a context where 35% of primary pupils in London are white British, with an employment gap resulting in 500,000 ‘missing’ ethnic minority workers, threatening the country’s future economic prosperity and social cohesion, this is no idle question. Nor, however, is it simply one of ‘whitewashing’ history. As we know from Michael Gove’s recent efforts to alter the curriculum, all history involves emphasizing certain moments or individuals rather than others, and it’s striking how much grandiose ‘high minded tosh’ (to quote the Supreme Court Judge Lord Sumption) we still tell ourselves and our children in this 800th year of Magna Carta and 50th year of the first (lamentably weak) Race Relations Act. It’s a bizarre position to object to removing statues of Cecil Rhodes on grounds of historical accuracy while failing to interrogate our wider, deeper national myths. In calling for the statue of Rhodes to be removed from Oriel College, Oxford, activists are calling for a more accurate portrayal of English history, less encumbered by the 17th century legacy of Sir Edward Coke and his many Whig heirs, left and right. Demanding that the Rhodes statue must fall is indeed symbolic, but not merely so: the aim is to start a wider more honest conversation not only about our past, but about the past’s continued effects on Black and minority ethnic people living in the UK today, and indeed around the world. It certainly shows chutzpah to accuse these activists of totalitarian attacks on free speech, mere hurt feelings and of rewriting history when our current history is such a well-engineered and repeated fairy tale that ignores Britain’s role in creating historic racial inequalities that persist to this day. This fantasy not only continues to harm Black and minority ethnic people living in Britain today, but also continues to benefit the descendants of all of Rhodes’s fellow white British citizens, both economically and psychologically. Exposing that reality – and seeking to change it – is the true aim of the Rhodes Must Fall movement, and one that its critics have failed to address.